Prefecture building of the Nord department, in Lille. Nord is a department in the north of France, in the Hauts-de-France region. Its name is because the department is in the north of France. Its prefecture is Lille. Nord is one of the original 83 departments created during the French Revolution on 4 March 1790 with Douai as is capital. It was divided in eight districts: Avesnes, Bergues, Cambrai, Douai, Hazebrouck, Lille, Le Quesnoy and Valenciennes. In 1800, with the creation of the arrondissements in France, the eight districts were changed into six arrondissements: Avesnes, Bergues, Cambrai, Cassel, Douai and Lille. In 1803, the capital of the department was moved from Douai to Lille and the subprefecture of Bergues was moved to Dunkirk. The arrondissement of Valenciennes was created in 1824. The subprefecture of Cassel was moved to Hazebrouck in 1857. On 10 September 1926, the arrondissement of Hazebrouck was eliminated. In 1962, the name of the commune Avesnes was changed to Avesnes-sur-Helpe. Nord is part of the Hauts-de-France region. It has an area of 5,742.8 km2 (2,217 sq mi). The highest point in the department is in the commune of Anor (49°59′48″N 4°9′32″E﻿ / ﻿49.99667°N 4.15889°E﻿ / 49.99667; 4.15889﻿ (Nord High Point)) near the border with Belgium; it is 271 m (889 ft) high. Several rivers flow through the department; the main rivers are the Scheldt/Escaut, the Yser, the Lys, the Scarpe, and the Sambre. The Köppen climate classification type for the climate at Lille is an "Oceanic climate" (also known as Marine West Coast Climate) and of the subtype "Cfb". The average amount of precipitation for the year in Lille is 645.2 mm (25.4 in). The month with the most precipitation on average is October with 63.5 mm (2.5 in) of precipitation. The month with the least precipitation on average is February with an average of 40.6 mm (1.6 in). The average temperature for the year in Lille is 10.8 °C (51.4 °F). The warmest month, on average, is July with an average temperature of 18.6 °C (65.5 °F). The coolest month on average is January, with an average temperature of 3.6 °C (38.5 °F). Nord is managed by the Departmental Council of Aisne in Lille. 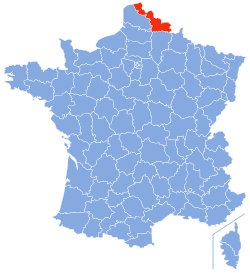 The department is part of the Hauts-de-France region. There are 6 arrondissements (districts), 41 cantons and 648 communes (municipalities) in Nord. The inhabitants of Nord are known, in French, as Nordistes. Nord had a population, in 2014, of 2,603,472, for a population density of 453.3 inhabitants/km2. The arrondissement of Lille, with 1,232,513 inhabitants, is the arrondissement with more inhabitants. ↑ "Président". Aisne.com. Conseil Général de l'Aisne. Retrieved 30 October 2016. ↑ 2.0 2.1 "Département du Nord (59)". Comparateur de territoire (in French). Institut national de la statistique et des études économiques - INSEE. Retrieved 7 November 2017. ↑ 3.0 3.1 "Populations légales 2014 des départements et des collectivités d'outre-mer" (in French). Institut national de la statistique et des études économiques - INSEE. Retrieved 7 November 2017. ↑ 4.0 4.1 4.2 "Historique du Nord". Le SPLAF (in French). Retrieved 7 November 2017. ↑ "Nord High Point, France". Peakbagger.com. Retrieved 7 November 2017. ↑ "Lille, France - Köppen Climate Classification". Weatherbase. Retrieved 7 November 2017. ↑ "Département du Nord (59)" (in French). Institut national de la statistique et des études économiques - INSEE. Retrieved 9 November 2017. ↑ 8.0 8.1 8.2 8.3 "Régions, départements, arrondissements, cantons et communes" (PDF). Populations légales 2014 (in French). Institut national de la statistique et des études économiques - INSEE. Retrieved 7 November 2017. ↑ "Département du Nord (59) et Arrondissements". Comparateur de territoire (in French). Institut national de la statistique et des études économiques - INSEE. Retrieved 7 November 2017. ↑ "Décret n° 2014-167 du 17 février 2014 portant délimitation des cantons dans le département du Nord" (in French). 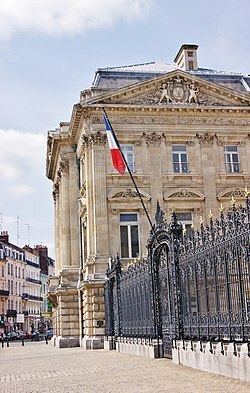 Légifrance.gouv.fr. Retrieved 7 November 2017. ↑ "Habitants du départment: Nord" (in French). habitants.fr. Retrieved 7 November 2017. Wikimedia Commons has media related to Nord. This page was last changed on 3 December 2017, at 07:52.